It isn’t like annual meeting events actually began today: NEA has been holding various conferences since Monday, and some leaders have been in town since the weekend. By the evening tonight, virtually all Ohio’s delegates had arrived, and most of those had registered in the Ohio delegation headquarters in the Mansion Room on the fourteenth floor. 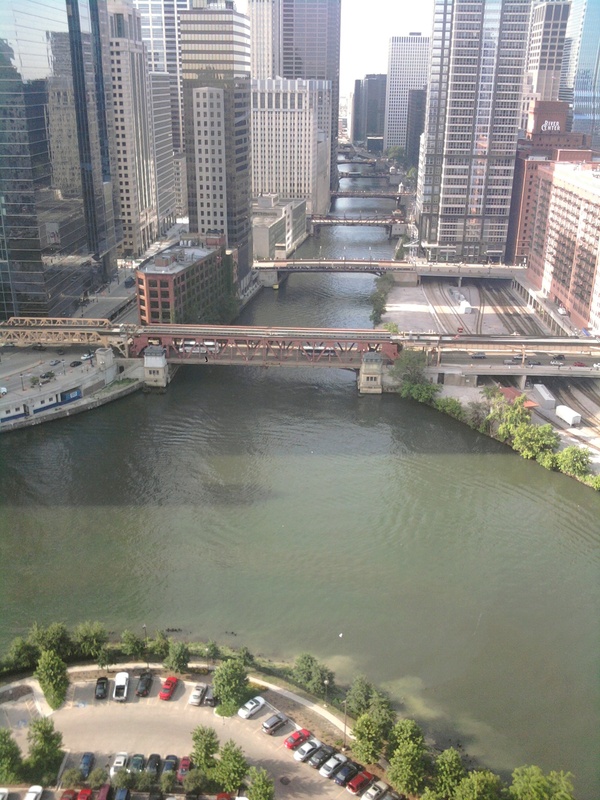 Our hotel is just across Orleans Street from the Merchandise Mart and overlooks the intersection of the north, main, and south branches of the Chicago River. Some of us are lucky enough to have rooms with spectacular views. The hotel itself sits atop thirteen floors of office space associated with the Merchandise Mart: hotel property begins with banquet facilities and offices on the fourteenth floor, a lobby on the fifteenth, and guest rooms going up from there. Registration and exhibits opened at McCormick Place this morning, so many delegates headed there to register and to pick up literature and assorted freebies from the various exhibitors. Leaders of state delegations were interviewing candidates for NEA positions that will be elected on Saturday. For many delegates, this is a good day to see the host city. They don’t have a lot of responsibilities yet: the RA itself won’t start until Saturday, and states won’t hold their first caucuses here until tomorrow. The weather held off until the evening, when we were treated to a spectacular thunderstorm with heavy hail. The big event of this evening is always Ohio Night, which is OEA’s reception for delegates at the host city. This year’s Ohio Night offered dinner along with desserts, cash bars, and dancing. It went on until midnight, but it had to do so without me: tomorrow’s first caucus starts at 7:30. For a look online at the work of the Annual Meeting, check out nea.org/RA. For NEA’s Annual Meeting Blog, go to RAtodayonline.org/. I always enjoyed reading your take on the RA when I was a delegate, and i’m looking forward to read your reports as an observer this year. I am particularly interested in: How popular is the early endorsement for reelection of the President? Will Pres. Obama speak in person to the assembly? and What will the RA say about merit pay and the whole evaluation process? “Spectacular thunderstorm with heavy hail” in the windy city. Enjoy! Vice president Biden is attending Sunday. OEA caucus supported early endorsement. NEA body votes on it Monday by secret vote. I really appreciate Bill’s blog and always direct our ECEA members to it for an awesome recap of events.